The Skinner North debate team first participated in tournaments during the 2017/2018 school year. The team is coached by, Skinner North 7th & 8th-grade science teacher, Ms. Machado-Schlossberg. Students from Walter Payton College Prep high school have also assisted with the coaching. The team typically meets once a week to practice. Tournaments are held year-round. 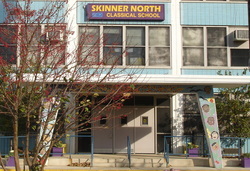 Skinner North has typically participated in approximately six tournaments.